Reading can provide many delights; you can immerse yourself in a detailed world not your own, you can be led to laughter, engaged by a tense story, endeared to well-drawn characters, enlightened by fiction that draws from history. In 'The Fifth heart,' Dan Simmons does all of these, pretty much at once, with an ease that makes it all deceptively fun. The setup is smart and fast. We meet Henry James in 1893, considering suicide as he stands on the bank of the Seine River. He's joined by a tall fellow with an aquiline profile who advises him to reconsider. This man introduces himself as Sherlock Holmes, and he confides in James that he too was considering suicide because, after the incident at Reichenbach Falls, he's come to the conclusion that he's a fictional character. The best cure for this, he suggests, is that James help him unravel a murder that seems to have been a suicide. From the moment the book starts, Simmons' prose voice is a critical part of the pleasure. We meet a very peculiar first-person narrator before the closely-observed third person narrations that make up moat of the novel begin. There's clearly a layer of meta-fiction happening in 'The Fifth Heart,' but Simmons plays this quite effectively for laughs. Yet he easily transports readers into his historical setting with detailed prose and a certain level of gravity and gravitas that his characters require. If you like the "take me away" effect of the best historical fiction, you'll find it here, leavened by some very funny meta-satire that is wildly and wonderfully original. The meat of the story sets Holmes, James, Simmons and the reader on a journey to discover identity in all its definitions. Holmes whisks James back to Washington DC, where they mix it up with The Five Hearts, to solve the murder-masked-as-suicide of Clover Adams. The Five Hearts included Henry and the late Clover, Clarence King, John Hay and Hay's wife Clara. But once they embark on their exploration of the reasons behind her death, they become embroiled in a battle with Holmes' nemesis, Moriarty. Plans have been made, and lives are at stake. Driving the book are the two main characters, Holmes and James. For all that the James we know from history is rather dry, here he's lots of fun. Holmes keeps him on =his toes and always a step or two behind. But Simmons makes sure that James rings really true, and his insights into those around him are truly Jamesian. As a counterweight and counter point, we get to know a very different Holmes here. Her fits into the canon, to be sure, but Simmons has gone out of his way to play with the least explored parts of Holmes' life. Putting the two together is a recipe for fantastic (in all senses of the word) dialogue. Aiding and abetting the two masterminds here is a stellar cast of well-wrought figures from history and fiction. Samuel Clemens is particularly fun, and Holmes' talk about Watson, especially as taken from "the canon" is s total hoot. The political movers and shakers flesh out the history and the humanity of the story. The joys of reading this book are all over the map. 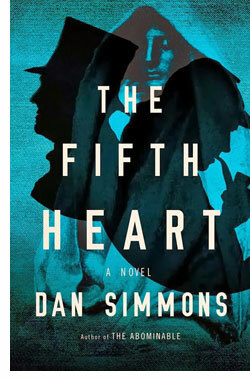 As a historical mystery, wedged into the cracks of actual reality and the gnarly body of the Holmesian canon, 'The Fifth Heart' delivers the kind of detail and reflections that are endlessly fun. As an identity-driven character study, 'The Fifth Heart' inspires introspection and intellection with a light-hearted feeling that is electric and engaging. And, in a really odd twist, it's fun to explore both the real history and the Holmesian canon in this work of fiction. Be aware before you read it that 'The Fifth Heart' is a gripping page-turner, and clear your schedule accordingly. Simmons is one of our best working writers; he achieves real depth in his character, plot and themes even as he entertains the hell out of readers with just the right mix of tension and detail. "The Fifth Heart' is a perfect example of every reason to read. You can feel good about feeling good, knowing that the author of your life at least has great taste in books.